Chair and garden are done. The chair colors are buttercream (pale yellow), orange and hunter green. The spindles on the back of the chair that you can not see are the hunter green ones. Our camera is not very clear....or it could be the picture taker herself, but I prefer to blame it on the camera. The garden includes, Wooly Lambs ear, white Oxalis, cascading Rosemary, creeping Thyme and in the center is as Lavender. I planted plugs of Irish Moss in three places hoping it will eventually cover the bare dirt and make a comfy place for the fey to have a tea party. April 2nd and the temps are in the 90's, the hot air from Mexico has arrived early this year and formed it's cap over us. That means the temperature at ground level must reach the low 100's to break the cap before rain will have a chance to move across us. This thing doesn't usually start to hang around until June and after. Got the cucumber seedlings in the ground today too, had to get them in the ground before the full moon. I made the mistake of planting them last year in the wrong moon phase and they were a dismal failure even before the drought started. Anyway, I went to the garden center yesterday and found Patchouli plants that I was afraid I had missed the chance to get....got three in the ground this morning. Along with a Santolina Virens....Green Lavender Cotton....never had one before and it certainly smells nice. Also got a Red/gold Yarrow, two white oxalis and found two of the eyeball plants that pinkiered had mentioned in a forum post a couple of weeks ago. Really cool, I have one planted out back and will plant the other in a pot out front tomorrow. 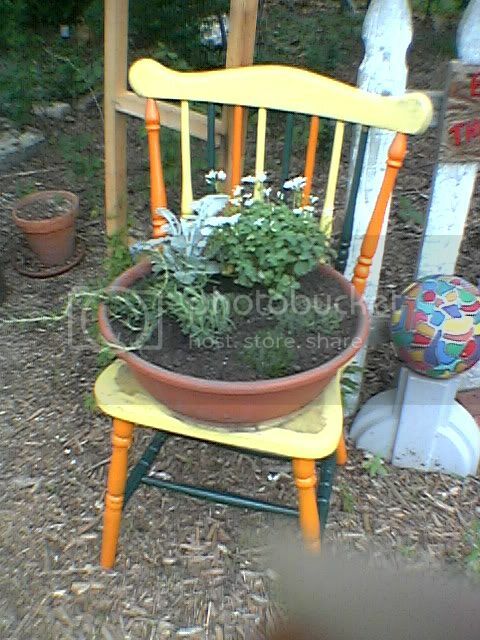 In early March I was given a semi-ratty old wooden chair to use to hold a faerie garden. Bought a cascading Rosemary, creeping Thyme, Lambs Ear, small Lavender and some Irish Moss. One of the white oxalis will go in there too. Still need to find Lady's Mantle and Sweet Woodruff, but I know of garden center a few miles from here that usually has those two. 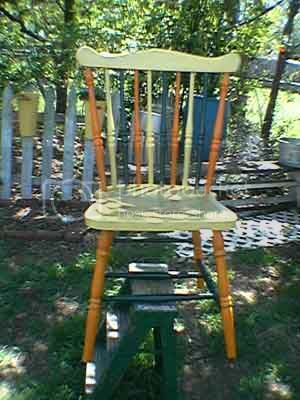 I painted the chair, buttercream (pale yellow), orange and hunter green. Just need to spray with sealer, let dry and get the plants in their planter.......and decide where to put it. Also found a couple of my hollyhock youngun's that are blooming already, my roses are in full bloom and all the perennials are climbing to the stars with all this warm weather we are having. The chocolate vine is even finally putting on some growth. I hope to get several pictures taken and posted on the forum this week. Plants, garden "art" and the plant markers I made from plastic CD holders.